For other institutions named Trinity College, see Trinity College (disambiguation). Trinity College (Irish: Coláiste na Tríonóide), officially the College of the Holy and Undivided Trinity of Queen Elizabeth near Dublin, is the sole constituent college of the University of Dublin, a research university located in Dublin, Ireland. The college was founded in 1592 by Queen Elizabeth I as the "mother" of a new university,[Note 1] modelled after the collegiate universities of Oxford and Cambridge, but unlike these other ancient universities, only one college was ever established; as such, the designations "Trinity College" and "University of Dublin" are usually synonymous for practical purposes. The college is legally incorporated by "the Provost, Fellows, Foundation Scholars and other members of the Board" as outlined by its founding charter. It is one of the seven ancient universities of Britain and Ireland, as well as Ireland's oldest surviving university. Trinity College is widely considered the most prestigious university in Ireland and amongst the most elite in Europe, principally due to its extensive history, reputation for social elitism and unique relationship with both the University of Oxford and the University of Cambridge. In accordance with the formula of ad eundem gradum, a form of recognition that exists among the three universities, a graduate of Oxford, Cambridge, or Dublin can be conferred with the equivalent degree at either of the other two universities without further examination. Trinity College, Dublin is a sister college to St John's College, Cambridge and Oriel College, Oxford. Originally Trinity was established outside the city walls of Dublin in the buildings of the outlawed Catholic Augustinian Priory of All Hallows. Trinity College was set up in part to consolidate the rule of the Tudor monarchy in Ireland, and as a result was the university of the Protestant Ascendancy for much of its history. While Catholics were admitted from 1793 certain restrictions on membership of the college remained as professorships, fellowships and scholarships were reserved for Protestants. These restrictions were lifted by Act of Parliament in 1873. However, from 1871 to 1970, the Catholic Church in Ireland in turn forbade its adherents from attending Trinity College without permission. Women were first admitted to the college as full members in January 1904. Trinity College is now surrounded by central Dublin and is located on College Green, opposite the historic Irish Houses of Parliament. The college proper occupies 190,000 m2 (47 acres), with many of its buildings ranged around large quadrangles (known as 'squares') and two playing fields. Academically, it is divided into three faculties comprising 25 schools, offering degree and diploma courses at both undergraduate and postgraduate levels. 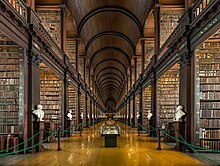 The Library of Trinity College is a legal deposit library for Ireland and Great Britain, containing over 6.2 million printed volumes and significant quantities of manuscripts, including the Book of Kells. Following this, and some debate about a new university at St. Patrick's Cathedral, in 1592 a small group of Dublin citizens obtained a charter by way of letters patent from Queen Elizabeth[Note 1] incorporating Trinity College at the former site of All Hallows monastery, to the south east of the city walls, provided by the Corporation of Dublin. The first provost of the college was the Archbishop of Dublin, Adam Loftus (after whose former college at Cambridge the institution was named), and he was provided with two initial Fellows, James Hamilton and James Fullerton. Two years after foundation, a few Fellows and students began to work in the new college, which then lay around one small square. During the following fifty years the community increased the endowments, including considerable landed estates, were secured, new fellowships were founded, the books which formed the foundation of the great library were acquired, a curriculum was devised and statutes were framed. The founding Letters Patent were amended by succeeding monarchs on a number of occasions, such as by James I in 1613 and most notably in 1637 by Charles I (who increased the number of fellows from seven to sixteen, established the Board – then the Provost and the seven senior Fellows – and reduced the panel of Visitors in size) and supplemented as late as the reign of Queen Victoria (and later still amended by the Oireachtas in 2000). During the eighteenth century Trinity College was seen as the university of the Protestant Ascendancy. Parliament, meeting on the other side of College Green, made generous grants for building. The first building of this period was the Old Library building, begun in 1712, followed by the Printing House and the Dining Hall. During the second half of the century Parliament Square slowly emerged. The great building drive was completed in the early nineteenth century by Botany Bay, the square which derives its name in part from the herb garden it once contained (and which was succeeded by Trinity College's own Botanic Gardens). Following early steps in Catholic Emancipation, Catholics were first allowed to apply for admission in 1793, prior to the equivalent change at the University of Cambridge and the University of Oxford. Certain disabilities remained. In December 1845 Denis Caulfield Heron was the subject of a hearing at Trinity College. Heron had previously been examined and, on merit, declared a scholar of the college but had not been allowed to take up his place due to his Catholic religion. Heron appealed to the Courts which issued a writ of mandamus requiring the case to be adjudicated by the Archbishop of Dublin and the Primate of Ireland. The decision of Richard Whately and John George de la Poer Beresford was that Heron would remain excluded from Scholarship. This decision confirmed that the legal position remained that persons who were not Anglicans (Presbyterians were also affected) could not be elected to Scholarship, Fellowship or be made a Professor. However within less than three decades of this all disabilities imposed on Catholics were repealed as in 1873, all religious tests were abolished, except for entry to the divinity school. However, the Irish Catholic bishops responding to the increased ease, due to these changes, with which Catholics could attend an Institution which the Bishops saw as thoroughly Protestant in ethos, and in light of the establishment of the Catholic University, in 1871 implemented a general ban on Catholics entering Trinity College, with few exceptions. "The ban" despite its longevity, is associated in the popular mind with Archbishop of Dublin John Charles McQuaid as he was made responsible for enforcing the ban from 1956 until it was rescinded by the Catholic Bishops of Ireland in 1970, shortly before McQuaid's retirement. Prior to 1956 it was the responsibility of the local Bishop. Women were admitted to Trinity College as full members for the first time in 1904. For the period from 1904 to 1907, women from Oxford and Cambridge came to Trinity College to receive their ad eundem degree and were known as Steamboat ladies. In 1907, the Chief Secretary for Ireland proposed the reconstitution of the University of Dublin. A "Dublin University Defence Committee" was created and was successful in campaigning against any change to the status quo, while the Catholic bishops' rejection of the idea ensured its failure among the Catholic population. Chief among the concerns of the bishops was the remains of the Catholic University of Ireland, which would become subsumed into a new university, which on account of Trinity College would be part Anglican. Ultimately this episode led to the creation of the National University of Ireland. Trinity College was one of the targets of the Volunteer and Citizen Army forces during the 1916 Easter Rising but was successfully defended by a small number of unionist students most of whom were members of the university Officers' Training Corps. From July 1917 until March 1918 the Irish Convention met in the college in an attempt to address the political aftermath of the Easter rising. (Subsequently, following the failure of the Convention to reach "substantial agreement", the Irish Free State was set up in 1922.) In the post-independence period Trinity College suffered from a cool relationship with the new state. On 3 May 1955 the Provost, Dr A.J. McConnell, pointed out in a piece in the Irish Times that certain state-funded County Council scholarships excluded Trinity College from the list of approved institutions. This, he suggested, amounted to religious discrimination, which was forbidden by the constitution. In 1970 the Catholic Church lifted its ban on Catholics attending the college without special dispensation. At the same time, the Trinity College authorities invited the appointment of a Catholic chaplain to be based in the college. There are now two such Catholic chaplains. In the late 1960s, there was a proposal for University College, Dublin, of the National University of Ireland, to become a constituent college of a newly reconstituted University of Dublin. This plan, suggested by Brian Lenihan and Donogh O'Malley, was dropped after opposition by Trinity College students. Trinity College is today in the centre of Dublin. At the beginning of the new century, it embarked on a radical overhaul of academic structures to reallocate funds and reduce administration costs, resulting in, for instance, the mentioned reduction from six to five to eventually three faculties under a subsequent restructuring by a later governing authority. The ten-year strategic plan prioritises four research themes with which the college seeks to compete for funding at the global level. Comparative funding statistics reviewing the difference in departmental unit costs and overall costs before and after this restructuring are not however apparent. The Hamilton Mathematics Institute in Trinity College, named in honour of William Rowan Hamilton, was launched in 2005 and aims to improve the international profile of Irish mathematics, to raise public awareness of mathematics and to support local mathematical research through workshops, conferences and a visitor programme. Trinity College retains a tranquil collegiate atmosphere despite its location in the centre of a capital city (and despite its being one of the most significant tourist attractions in Dublin). This is, in large part, due to the compact design of the college, whose main buildings look inwards and are arranged in large quadrangles (called squares), and the existence of only a few public entrances. The main college grounds are approximately 190,000 m2 (47 acres), including the Trinity College Enterprise Centre nearby, and buildings account for around 200,000 m², ranging from works of older architecture to more modern buildings. The main entrance to the college is on the College Green, and its grounds are bounded by Nassau and Pearse Streets. The college is bisected by College Park, which has a cricket and rugby pitch. The western side of the college is older, featuring the iconic Campanile, as well as many fine buildings, including the Chapel and Examination Hall (designed by Sir William Chambers), Graduates Memorial Building, Museum Building, and the Rubrics, all spread across College's five squares. The Provost's House sits a little way up from the College Front Gate such that the House is actually on Grafton Street, one of the two principal shopping streets in the city, while its garden faces into the college. The Douglas Hyde Gallery, a contemporary art gallery, is located in the college as is the Samuel Beckett Theatre. It hosts national and international performances, and is used by the Dublin International Theatre Festival, the Dublin Dance Festival, and The Fringe Festival, among others. During the academic term it is predominantly used as a teaching and performance space for Drama students and staff. The eastern side of the college is occupied by Science buildings, most of which are modern developments, arranged in three rows instead of quadrangles. In 2010, Forbes ranked the it as one of the 15 most beautiful college grounds in the world. A panorama taken from Parliament Square. The row of buildings is framed by the Public Theatre on the left and the Chapel on the right. In the middle lies Regent House with its archway leading to the Front Gate. The current chapel was completed in 1798, and was designed by George III's architect, Sir William Chambers, who also designed the public theatre opposing the chapel on Parliament Square. Reflecting the college's Anglican heritage, there are daily services of Morning prayer, weekly services of Evensong, and Holy Communion is celebrated on Mondays and Sundays. It is no longer compulsory for students to attend these. The chapel has been ecumenical since 1970, and is now also used daily in the celebration of Mass for the Roman Catholic members of the college. In addition to the Anglican chaplain, who is known as the Dean of Residence, there are two Roman Catholic chaplains and one Methodist chaplain. Ecumenical events are often held in the chapel, such as the annual carol service and the service of thanksgiving on Trinity Monday. In November 2018, the College announced plans, estimated at €230 million, to redevelop the campus and a new hub near Grand Canal Dock. The Old Library, housing the Book of Kells and other ancient manuscripts. The college, officially incorporated as The Provost, Fellows and Scholars of the College of the Holy and Undivided Trinity of Queen Elizabeth near Dublin, is headed by the Provost. Patrick Prendergast has been the Provost since 2011. The body corporate of the college consists of the provost, fellows and scholars. The college is governed according to its statutes which are, in effect, the College Constitution. Statutes are of two kinds, those which originally could only be amended by Royal Charter or Royal Letters Patent, and which now can only be changed by an Act of the Oireachtas and those which can be changed by the board, but only with the consent of the Fellows. When a change requires parliamentary legislation, the customary procedure is that the Board requests the change by applying for a Private Bill. For this the consent of the whole Body Corporate is needed, with Scholars voting alongside Fellows. An example of a change that requires parliamentary legislation is an alteration to the composition of the Board. This last happened when the governance of the college and university was revised and restated by an Act of the Oireachtas in 2000. The Provost serves a ten-year term and is elected by a body of electors consisting essentially of all full-time academic staff, and a very small number of students. Originally the Provost was appointed for life. While the Provost was elected by the Fellows at the start, the appointment soon became a Crown one, reflecting the growing importance of the college and of the office of provost, which became both prestigious and well paid. However, as time passed it became customary that the appointments were only made after taking soundings of college opinion, which meant mostly the views of the Board. With the establishment of the Free State in 1922 the power of appointment passed to the Government. It was agreed that when a vacancy occurred the college would provide a list of three candidates to the Government, from which the choice would be made. The college were allowed to rank the candidates in order of preference and in practice the most preferred candidate was always appointed. Now the Provost while still formally appointed by the Government is elected by staff plus student representatives, who gather in an electoral meeting, and vote by exhaustive ballot until a candidate obtains an absolute majority; the process takes a day. The Provost takes precedence over everyone else in the college, acts as the chief executive and accounting officer and chairs the board and council. The provost also enjoys a special status in the University of Dublin. Fellows and scholars are elected by the board. Fellows were once elected for life on the basis of a competitive examination. The number of fellows was fixed and a competition to fill a vacancy would occur on the death or resignation of a fellow. Originally all the teaching was carried out by the Fellows. Fellows are now elected from among current college academics, serve until reaching retirement age, and there is no formal limit on their number. Only a minority of academic staff are fellows. Election to fellowship is recognition for staff that they have excelled in their field and as such, amounts to a promotion for those receiving it. Any person appointed to a professorship who is not already a fellow, is elected a fellow at the next opportunity. Scholars continue to be selected by competitive examination from the Undergraduate body. The Scholarship examination is now set according to the several undergraduate courses. (So there is a scholarship examination in History, or in Mathematics or Engineering, and so forth). The Scholarship examination is taken in the second year of a four-year degree course (though, in special circumstances, such as illness, bereavement, or studying abroad during the second year, permission may be given to sit the examination in the third year). In theory, a student can sit the examination in any subject, not just the one they are studying. They hold their Scholarship until they are of "MA standing" that is, three years after obtaining the BA degree. (So most are Scholars for a term of five years). Fellows are entitled to residence in the college free of charge; most fellows do not exercise this right in practice, with the legal requirement to provide accommodation to them being fulfilled by providing an office. Scholars are also entitled to residence in the college free of charge, they also receive an allowance, and have the fees paid for courses they are taking within the college. However, due to pressure on college accommodation, Scholars are no longer entitled (as they once were) to free rooms for the full duration of their scholarship should they cease to be students. Fellows and Scholars are also entitled to one free meal a day, usually in the evening ("Commons"). Scholars retain the right to free meals for the full duration of their scholarship even after graduation, and ceasing to be students, should they choose to exercise it. Aside from the Provost, Fellows and Scholars, Trinity College has a Board (dating from 1637), which carries out general governance. Originally the Board consisted of the Provost and Senior Fellows only. There were seven Senior Fellows, defined as those seven fellows that had served longest, Fellowship at that time being for life, unless resigned. Over the years a representational element was added, for example by having elected representatives of the Junior Fellows and of those Professors who were not Fellows, with the last revision before Irish Independence being made by Royal Letters Patent in 1911. At that time there were, as well as the Senior Fellows, two elected representatives of those Professors that were not Fellows and elected representatives of the Junior Fellows. Over the years, while formal revision did not take place, partly due to the complexity of the process, a number of additional representatives were added to the Board but as "observers" and not full voting members. These included representatives of academic staff who were not Fellows, and representatives of students. In practice all attending Board meetings were treated as equals, with votes while not common, being taken by show of hands. But it remained the case, that legally only the full members of the Board could have their votes recorded and it was mere convention that they always ratified the decision taken by the show of hands. The fellows, non-fellow academic staff as well as non-academic staff are elected to serve for a fixed term. The four student members are the President, Education Officer and Welfare Officer of the Students' Union and the president of the Graduate Students' Union (all ex officio) and are elected annually for one-year terms. The vice-provost/chief academic officer, senior lecturer, registrar and bursar are 'annual officers' appointed for one-year (renewable) terms by the Provost. It will be noted that the two significant changes are that the Senior Fellows are no longer on the Board, and that two members of the Board are now drawn from without the college. There is a Council (dating from 1874), which oversees academic matters. All decisions of the Council require the approval of the Board, but if the decision in question does not require a new expenditure, the approval is normally formal, without debate. The Council had a significant number of elected representatives from the start, and was also larger than the Board, which at that time, continued to consist of the Provost and seven Senior Fellows only. The Council is the formal body which makes academic staff appointments, always, in practice on the recommendation of appointments panels, but which have themselves been appointed by the Council. An illustration of the relationship between the Board and the Council, is where a decision is made to create a new professorial chair. As this involves paying a salary, the initial decision to create the chair is made by the Council, but the decision to make provision for the salary is made by the Board, consequently the Board might over rule, or defer a Council decision on grounds of cost. The University of Dublin was modelled on University of Oxford and University of Cambridge in the form of a collegiate university, Trinity College being named by the Queen as the mater universitas ("mother of the university"). As no other college was ever established, the college is the sole constituent college of the university and so Trinity College and the University of Dublin are for most practical purposes synonymous. However, the actual statutes of the university and the college grant the university separate corporate legal rights to own property and borrow money and employ staff. Moreover, while the board of the college has the sole power to propose amendments to the statutes of the university and college, amendments to the university statutes require the consent of the Senate of the university. Consequently, in theory, the Senate can overrule the Board, but only in very limited and particular circumstances. However it is also the case that the university cannot act independently of the initiative of the Board of Trinity College. The most common example of when the two bodies must collaborate is when a decision is made to establish a new degree. All matters relating to syllabus, examination and teaching are for the college to determine, but actual clearance for the award of the degree is a matter for the university. In the same way when an individual is awarded an Honorary Degree, the proposal for the award is made by the Board of Trinity College, but this is subject to agreement by a vote of the Senate of Dublin University. All graduates of the university who have at least a master's degree are eligible to be members of the Senate, but in practice only a few hundred are, with a large proportion being current members of the staff of Trinity College. The college also has an oversight structure of two visitors, the chancellor of the university, who is elected by the Senate, and the judicial visitor, who is appointed by the Irish Government from a list of two names submitted by the Senate of the university. The current judicial visitor is the Hon. Dr. Justice Maureen Harding Clark. In the event of a disagreement between the two visitors, the opinion of the chancellor prevails. The visitors act as a final "court of appeal" within the college, with their modes of appointment giving them the needed independence from the college administration. Trinity College is a sister college to Oriel College of the University of Oxford and St John's College of the University of Cambridge. The School of Business in association with the Irish Management Institute forms the Trinity-IMI Graduate School of Management, incorporating the faculties of both organisations. Trinity College has also been associated in the past with a number of other teaching institutions. These include St Catherine's College of Education for Home Economics (now closed), Magee College and Royal Irish Academy of Music, which is a music conservatoire, as well as The Lir National Academy of Dramatic Art, which is the national conservatoire for theatre training actors, technicians, playwrights and designers to a professional and industry standard – the Lir is also advised by the Royal Academy of Dramatic Art in the UK. The university has been linked to parliamentary representation since 1613, when James I granted it the right to elect two members of parliament (MPs) to the Irish House of Commons. Since the new Constitution of Ireland in 1937, graduates of the university have formed a constituency which elects three Senators to Seanad Éireann. The current representatives of the university constituency are Ivana Bacik, David Norris and Lynn Ruane. Notable representatives have included Edward Gibson, W. E. H. Lecky, Edward Carson, Noel Browne, Conor Cruise O'Brien and Mary Robinson. The franchise was originally restricted to the Provost, Fellows and Scholars of Trinity College. This was expanded in 1832 to include those who had received an M.A. and in 1918 all those who had received a degree from the university. Each faculty is headed by a dean (there is also a Dean of Postgraduate Studies), and faculties are divided into schools, of which there were 24 as of 2012. Since 2014, Trinity College's Science Department has established and operated a scheme for second-level students to study science, technology, engineering, and mathematics. The system, similar to DCU's CTYI programme, encourages academically gifted secondary students with a high aptitude for the STEM subjects, was named the Walton Club in honour of Ernest Walton, Ireland's first and only Nobel laureate for Physics. The educators in the programme are PhD students in the college, and they impart an advanced, undergraduate-level curriculum onto the students. The club was set up with a specific ethos around the mentoring of STEM subjects, and not as a grinds school. The scheme, now in its third year, has been immensely successful and is perpetually growing in scope and scale year on year. It has also diversified beyond its traditional weekly club structure, running camps during school holidays to offer an opportunity to study STEM to those unable to join the club. It has also represented the college in many activities, meeting Chris Hadfield and attending the Young Scientist and Technology Exhibition and the Web Summit. Students, or alphas as they are dubbed in honour of the eponymous physicist, develop projects in the Club, with innovations pioneered there including a health-focused electroencephalogram. The club was founded by Professors Igor Shvets and Arlene O'Neill of the School of Physics in Trinity College. Most undergraduate courses require four years of study. First-year students at the undergraduate level are called Junior Freshmen; second years, Senior Freshmen; third years, Junior Sophisters; and fourth years, Senior Sophisters. After a proposal in 2017 by the SU Equality Committee, a three-year process changing the titles of first and second years to Junior and Senior Fresh was approved by the Trinity College Board. The Freshman Years usually have a set or minimally flexible basic curriculum with the Sophister years allowing for a much greater degree of course variation, as well as taking a year abroad. The passing of two sets of examinations is a prerequisite for a degree. Junior and Senior Freshmen sit preliminary annual exams in Trinity Term of each year which must be passed so that they "rise" to the year above. At the end of the Junior Sophister year, undergraduates sit Part I of the Moderatorship exams, subject to attaining an upper-second, allows them to take an Honours degree and sit the Part II (Final) of the Moderatorship exams. Successful candidates receive first-, upper or lower second-, or third-class honours, or simply a "pass" without honours if they perform insufficiently in Part I of the Moderatorship. Degree titles vary according to the subject of study. The Law School awards the LL.B., the LL.B. (ling. franc.) and the LL.B. (ling. germ.). Other degrees include the BAI (engineering) and BBS (business studies). The BSc degree is not in wide use although it is awarded by the School of Nursing and Midwifery; most science and computer science students are awarded a BA. From 2018, Trinity will be offering dual BA programme with Columbia University in New York City. Students of History, English, European Studies or Middle Eastern and European Languages and Culture spend their first two years at Trinity and their last two years at Columbia. At postgraduate level, Trinity offers a range of taught and research degrees in all faculties. About 29% of students are post-graduate level, with 1,440 students reading for a research degree and an additional 3,260 on taught courses (see Research and Innovation). The first week of Trinity Term (which marks conclusion of lecturing for that year) is known as Trinity Week; normally preceded by a string of balls, it consists of a week of sporting and academic events. This includes the Trinity Ball and the Trinity Regatta (a premier social event on the Irish rowing calendar held since 1898), the election of Scholars and Fellows and a college banquet. The Central Applications Office processes applications from Irish, British and European Union applicants for undergraduate courses on behalf of Trinity College. Decisions on admissions to undergraduate courses are made by Trinity College who instruct the CAO to make offers to successful candidates. Admission to the university is highly competitive, and based exclusively on academic merit. In order to be considered for admission, all applicants must first reach the university's minimal matriculation requirements, which typically involves holding sufficient recognised qualifications in English, Mathematics and a second language, however, the Mathematics requirement can be waived if Latin is presented as a second language. Furthermore, applicants for certain courses may be required to achieve more specific qualifications than those prescribed for minimum matriculation requirements. Eligible applicants must then compete for places based on the results of their school leaving examinations, however, applicants can additionally take matriculation examinations which are held in the university in April, in which each subject is considered equivalent to that of the Leaving Certificate. Applications for restricted courses require further assessment considered in the admissions process, such as the Health Professions Admissions Test (HPAT) for medicine or entrance tests for music and drama courses. As applications for most courses far exceeds available places, admission is highly selective, demanding excellent grades in the aforementioned examinations. Through the CAO, candidates may list several courses at Trinity College and at other third-level institutions in Ireland in order of preference. Places are awarded in mid-August every year by the CAO after matching the number of places available to the academic attainments of the applicants. Qualifications are measured as "points", with specific scales for the Leaving Certificate, UK GCE A-level, the International Baccalaureate and all other European Union school leaving examinations. For applicants who are not citizens or residents of the European Union, different application procedures apply. ; 16% of students are from outside Ireland, and 40% of these are from outside the European Union. Disadvantaged, disabled, or mature students can also be admitted through a program that is separate from the CAO, the Trinity Access Programme, which aims to facilitate the entry of sectors of society which would otherwise be under-represented. The numbers admitted on this program are significant relative to other universities, up to 15% of the annual undergraduate intake. Admission to graduate study is handled directly by Trinity College. Students who enter with exceptional Leaving Certificate or other public examination results are awarded an Entrance Exhibition. This entails a prize in the form of book tokens to the value of €150.00. Exhibitioners who are of limited means are made Sizars, entitled to Commons (evening meal) free of charge. Competition for Scholarship involves a searching examination and successful candidates must be of exceptional ability. The concept of scholarship is a valued tradition of the college, and many of the college's most distinguished members were elected scholars (including Samuel Beckett and Ernest Walton). The Scholars' dinner, to which 'Scholars of the decade' (those elected in the current year, and every year multiple of a decade previous to it, e.g., 2013, 2003,..) are invited, forms one of the major events in Trinity's calendar. A scholarship at Trinity College is a prestigious undergraduate award; a principal aim of the college is the pursuit of excellence, and one of the most tangible demonstrations of this is the institution of scholarship. Until 1856, only the classical subjects were examined. The questions concerned all the classical authors prescribed for the entrance examination and for the undergraduate course up to the middle of the Junior Sophister year. So candidates had no new material to read, 'but they had to submit to a very searching examination on the fairly lengthy list of classical texts which they were supposed by this time to have mastered'. The close link with the undergraduate syllabus is underlined by the refusal until 1856 to admit Scholars to the Library (a request for admission was rejected by the Board in 1842 on the grounds that Scholars should stick to their prescribed books and not indulge in 'those desultory habits' that admission to an extensive library would encourage). During the second half of the nineteenth century the content of the examination gradually came to include other disciplines. Around the turn of the 20th century, "Non-Foundation" Scholarships were introduced. This initially was a device to permit women to be, in effect, elected Scholars, despite the then commonly accepted legal view that the statute revision of 1637 only permitted males to be elected Foundation Scholars. Clearly when women were not permitted in the college, this had not caused any difficulties, but with the admission of women as full members of the college an anomaly was created. Non Foundation Scholarship granted to the women elected to it all the rights of men, but with the exception of voting rights at a meeting of the Body Corporate, a very rare event in any case. As women are now admitted to Foundation Scholarship on exactly the same basis as men Non-Foundation Scholarships are retained as a device to allow for more than seventy persons to be Scholars at any one time provided sufficient meet the qualifying standards. Foundation Scholarships are given to those whose performance is considered particularly exceptional, with the remaining qualifying persons that year being elected as Non Foundation Scholars. While the number of Foundation Scholars remains fixed at seventy, there is in theory no limit on the number of Non-Foundation scholars. It is worth noting that when the college had only a few hundred members the Foundation Scholars could easily amount to ten per cent of the whole undergraduate body; now that the college numbers members in thousands even the addition of current numbers of Non Foundation Scholars means that the proportion of students elected Scholars is still lower than it has even been before, and being elected to Scholarship is more competitive than it was. In 1999, the university purchased an Enterprise Centre on Pearse Street, seven minutes' walk from the on-site "Innovation Centre". The site has over 19,000 m² (200,000 ft²) of built space and contains a protected building, the Tower, which houses a Craft Centre. The Trinity Enterprise Centre houses companies drawn from the university research sector in Dublin. In response to a long-term decline in rankings (from 43rd according to the last combined THE/QS ranking in 2009 to 88th in QS and 117th in THE for 2018) Trinity announced a plan in 2014 to reverse the trend, aiming to re-enter the top 50 bracket. The dentistry program offered by the Dublin Dental University Hospital is ranked 51–75 in the world. Trinity College has a student life with 124 societies (in 2018). Student societies operate under the aegis of the Dublin University Central Societies Committee which is composed of the Treasurers of each of the Societies within the college. Society size varies enormously, and it is often hard to determine exact figures for most societies – several claiming to be the largest in the college with thousands of members, while smaller groups may have only 40–50 members. Situated within the Graduates Memorial Building is the University Philosophical Society (the Phil), sometimes referred to as one of the oldest of Ireland's such societies. Claiming to have been founded in 1683 (though university records list its foundation as having occurred in 1853) the society has strong history in debating and paper-reading. Consequently, over the past four centuries it has been addressed by the world's preeminent thinkers and orators. The society meets each Thursday evening to debate motions of interest in the chamber of the Graduates Memorial Building. It counts among its Honorary Patrons multiple Noble Prize laureates, Heads of State, notable actors, entertainers, well-known intellectuals, such as Al Pacino, Desmond Tutu, Sir Christopher Lee, Stephen Fry, and John Mearsheimer. Another such society is the College Historical Society (the Hist) which shares the GMB, founded in 1770 (which it makes it the oldest Society on Campus according to the College Calendar), meets each Wednesday evening of Term to debate motions in the chamber of the Graduate Memorial Building, has been addressed by many notable orators including Winston Churchill and Ted Kennedy, and counts among its former members many of the most prominent men and women in Ireland's history. Other societies include Vincent de Paul Society (VDP), which organises a large number of charitable activities in the local community; DU Players, one of the most prolific student-drama societies in Europe which hosts more than 50 shows and events a year in the Samuel Beckett Theatre; The DU Film Society (Formerly DU Filmmakers, formerly the DU "Videographic Society", founded in 1987) which organises filmmakers and film-lovers in college through workshops, screenings, production funding, etc. ; The DU Radio Society, known as Trinity FM, broadcasts a variety of student made productions on a special events licence on FM frequency 107.8FM for six weeks a year; The Trinity LGBT society, which is the oldest LGBT society in Ireland and celebrated its 25th anniversary in the 2007/2008 year; The Card and Bridge Society also holds weekly poker and bridge tournaments and was the starting point to many notable alum including Andy Black, Padraig Parkinson and Donnacha O'Dea ;The Dublin University Comedy Society, known as DU Comedy, hosts comedy events for its members and has hosted gigs in college from comedians such as Andrew Maxwell, David O'Doherty, Neil Delamere and Colin Murphy; The Dance Society, known as dudance, provides classes in Latin and ballroom dancing, as well as running events around other dance styles such as swing dancing. In 2011 the Laurentian Society was revived. This society played a key role as a society for the few Catholic students who studied at Trinity while "the Ban" was still in force. The Trinity Fashion Society was established in 2009, since then it holds an annual charity fashion show and hosts an international trip to London Fashion Week. The largest sports club in the college is the Boarding Club with over 1000 registered members. The newest club in the university is the American football team, who were accepted into the Irish American Football League (IAFL) in 2008. Initially known as the Trinity Thunderbolts, the club now competes under the name "Trinity College". The most successful Trinity College sports club – based on Intervarsities victories – is Dublin University Fencing Club (DU Fencing Club). A total of forty-one Intervarsity titles have been won by the club in sixty-four years of competition. While the modern DU Fencing Club was founded in 1936, its origins can be dated to the 1700s when a 'Gentleman's Club of the Sword' existed, primarily for duelling practice. There are several graduate sport clubs that exist separate to the Central Athletic Club including the Dublin University Museum Players (cricket), the Lady Elizabeth Boat Club (rowing) and the Mary Lyons Memorial Mallets (croquet). The Students' Union funds a monthly newspaper called The University Times. This paper was launched in 2009 replacing the University Record. The Record, first published in 1997, had previously replaced an older publication called Aontas. Trinity News is also published in Trinity, and is Ireland's oldest student newspaper, having been founded in 1953. As of 2010 it is published on a fortnightly basis, producing twelve issues in total during the academic year. The focus is on students with sections including College News, National News, International News, Features, Science, Sports Features and College Sports. The paper also includes the cultural magazine called TN2. For the last 10 years the paper has been edited by a full-time student editor, who takes a sabbatical year from their studies, supported by a voluntary part-time staff of 30 student section editors and writers. Ireland's only student-run financial newspaper The Bull is also published quarterly. Student magazines currently in publication as of 2012 include the satirical newspaper The Piranha (formerly Piranha! magazine but rebranded in 2009), the generalist T.C.D. Miscellany (founded in 1895; one of Ireland's oldest magazines), the film journal Trinity Film Review (TFR) and the literary Icarus. Other publications include the Student Economic Review and the Trinity College Law Review, produced independently by students of economics and law respectively, the Trinity College Journal of Postgraduate Research, produced by the Graduate Students Union, the Social and Political Review (SPR), now in its 22nd year, the Trinity Student Medical Journal, The Attic, student writing produced by the Dublin University Literary Society and the Afro-Caribbean Journal produced by the Afro-Caribbean Society. Some older titles currently not in publication include In Transit, Central Review, Harlot, Evoke, and Alternate. More recent publications include the counter-cultural magazine "The Burkean Journal"; a politically and culturally conservative magazine named after one of Trinity's most notable alumni, Edmund Burke. The Trinity Ball is an annual event that draws 7,000 attendants. Until 2010, it was held annually on the last teaching day of Trinity term to celebrate the end of lectures and the beginning of Trinity Week. Due to a restructuring of the teaching terms of the college the 2010 Ball was held on the last day of Trinity Week. In 2011, the ball was held on the final day of teaching of Hilary Term, before the commencement of Trinity Week. The Ball is run by Trinity Ents, Trinity Students' Union and Trinity's Central Societies Committee in conjunction with event promoters MCD Productions, who held the contract to run the Ball until 2012. The Ball celebrated its 50th anniversary in 2009. The Latin Grace is said "before and after meat" at Commons, a three-course meal served in the College Dining Hall Monday to Friday. Commons is attended by Scholars and Fellows and Sizars of the college, as well as other members of the college community and their guests. Most students of the college (undergraduates especially) never walk underneath the Campanile, as the tradition suggests that should the bell ring whilst they pass under it, they will fail their annual examinations. This is negated only if they touch the foot of the statue of George Salmon within five seconds of the bell ringing. All Names Have Been Changed, a novel by Claire Kilroy, is set in Trinity College in the 1990s. The story follows a group of creative writing students and their enigmatic professor. A photograph of Trinity is used in the cover art. The First Verse by Barry McCrea is another novel with Trinity College as its setting. The narrative focuses on freshman Niall Lenihan's search for identity and companionship, along with detailing his involvement with mysticism at the college. For a more comprehensive list, see List of Trinity College Dublin people, List of Scholars of Trinity College Dublin, and List of Provosts of Trinity College Dublin. Others include three previous holders of the office of President of Ireland; Douglas Hyde, Mary Robinson and Mary McAleese. ^ a b Extracts from Letters Patent ("First or Foundation Charter") of Elizabeth I, 1592: "...we...found and establish a College, mother of a (the) University, near the town of Dublin for the better education, training and instruction of Anglo-Protestant scholars and students in our realm...and also that provision should be made...for the relief and support of a provost and some fellows and scholars...it shall be called THE COLLEGE OF THE HOLY AND UNDIVIDED TRINITY NEAR DUBLIN FOUNDED BY THE MOST SERENE QUEEN ELIZABETH. And...we erect...that College with a provost, three fellows in the name of many, and three scholars in the name of many, to continue for ever. And further we make...Adam Loftus, D.D., archbishop of Dublin, chancellor of our kingdom of Ireland, the first...provost of the aforesaid College... And we make...Henry Ussher, M.A., Luke Challoner, M.A., Lancellot Moine, B.A., the first...fellows there... And we make...Henry Lee, William Daniell, and Stephen White the first...scholars... And further...we will...that the aforesaid provost, fellows and scholars of Trinity College aforesaid and their successors in matter, fact and name in future are and shall be a body corporate and politic, for ever incorporated...by the name of THE PROVOST, FELLOWS AND SCHOLARS OF THE COLLEGE OF THE HOLY AND UNDIVIDED TRINITY OF QUEEN ELIZABETH NEAR DUBLIN, and that in all future times they shall be known...by that name, and shall have perpetual succession...and we really and completely create...them...a body corporate and politic, to endure for ever... And whereas it appears that certain degrees have been of assistance in the arts and faculties, we ordain...that the students in this College of the holy and undivided Trinity of Queen Elizabeth near Dublin shall have liberty and power to obtain degrees of Bachelor, Master, and Doctor, at a suitable time, in all arts and faculties. ...and that they shall have liberty to perform among themselves all acts and scholastic exercises for gaining such degrees, as shall seem fit to the provost and the majority of the fellows, (and that they may elect...all persons for better promoting such things, whether Vice-Chancellor, Proctor or Proctors), (for we have approved assignment of the dignity of Chancellor to...William Cecil, Baron Burghley...and...when he shall cease to be chancellor...the provost and the majority of the fellows shall elect a suitable person of this sort as chancellor of the College. And the chancellor, or his vice-chancellor, with the archbishop of Dublin, the Bishop of Meath, the vice treasurer, the treasurer for war, and the chief justice of our chief place within this our kingdom of Ireland, the mayor of the city of Dublin for the time being, or the majority of them who shall be called visitors, shall break off and limit all contentions, actions and controversies (which the provost and the majority of the fellows cannot settle), and that they shall punish all the graver faults not amended by the provost and fellows.)" ^ Trinity Hall which houses 1,100 students, of whom the majority are first years. ^ "Division – College" (PDF). The 2010 Consolidated Statutes of Trinity College Dublin and of the University of Dublin. Trinity College, Dublin. Archived from the original (PDF) on 6 October 2012. Retrieved 30 April 2015. ^ "Ionaid agus seoltaí – Oifig na Gaeilge : Trinity College Dublin, the University of Dublin, Ireland". Trinity College. 21 November 2014. Retrieved 20 December 2015. ^ a b "Speech at Vietnam National University: Entrepreneurship-Innovation-Research: the education mission at Trinity College Dublin, the University of Dublin". Retrieved 22 October 2017. ^ a b "Breaking down Trinity's shield". "The name is, of course, a reference to the Christian doctrine that defines God as three consubstantial entities (via a tribute to Trinity College, Cambridge)." The Irish Times. 5 April 2014. Retrieved 17 July 2016. The Trinity was the patron of The Dublin Guild Merchant, primary instigators of the foundation of the University, the arms of which guild are also similar to those of the College. ^ "Patrick Prendergast – Candidates – Provost Appointment". Trinity College, Dublin. 7 February 2011. Retrieved 24 July 2012. ^ a b c "Full-time enrolments in Universities in the academic year 2016/2017". Higher Education Authority Statistics Archive. Retrieved 11 March 2018. ^ a b c "Part-time enrolments in Universities in the academic year 2016/2017". Higher Education Authority Statistics Archive. Retrieved 11 March 2018. ^ "TCD Corporate and Legal FAQ". www.tcd.ie. 30 May 2018. ^ Sarah Hutton (15 May 2015). British Philosophy in the Seventeenth Century. Oxford University Press. pp. 27–. ISBN 978-0-19-958611-0. ^ "History - Trinity College Dublin". Tcd.ie. ^ "Does Trinity have a class problem?". universitytimes.ie. ^ "Statute X: Degrees, Diplomas, and Certificates". Statutes and Regulations, University of Oxford. ^ a b O'Neill, Sean; Hamilton, Fiona (17 June 2005). "Professor A. Norman Jeffares. Prolific scholar who specialised in W. B. Yeats and Irish literature while energetically espousing Commonwealth writers". The Times. London. ^ a b "Church of Ireland Notes from The Irish Times". Ireland.anglican.org. 19 November 2005. Retrieved 28 April 2010. ^ Hermans, Jos M. M.; Nelissen, Marc (21 January 2018). "Charters of Foundation and Early Documents of the Universities of the Coimbra Group". Leuven University Press. Retrieved 21 January 2018 – via Google Books. ^ "CATHOLICS AND TRINITY COLLEGE, DUBLIN. (Hansard, 8 May 1834)". Hansard.millbanksystems.com. ^ Robert Brendan McDowell; David Allardice Webb (1982). Trinity College, Dublin, 1592–1952: An Academic History. Cambridge University Press. ISBN 978-0-521-23931-8. ^ "Legal FAQ - Secretary's Office - Trinity College Dublin". www.tcd.ie. Retrieved 2019-03-18. ^ "IOL.ie". IOL.ie. 22 January 2000. Retrieved 28 April 2010. ^ "TCD.ie". TCD.ie. 12 March 2010. Archived from the original on 5 January 2010. Retrieved 28 April 2010. ^ Dublin, Provost & President, Trinity College. "Thomas Noel Mitchell - Provost & President : Trinity College Dublin". Tcd.ie. Retrieved 21 January 2018. ^ "TCD Strategic Plan 2006" (PDF). Tcd.ie. Retrieved 23 July 2016. ^ "The World's Most Beautiful College Campuses". Forbes. ^ Dublin, New Website, Trinity College. "History - About Trinity : Trinity College Dublin". Tcd.ie. Retrieved 21 January 2018. ^ "Chaplaincy - Trinity College Dublin". Tcd.ie. Retrieved 21 January 2018. ^ "Microsoft Word - Statutes-Current.doc" (PDF). Archived from the original (PDF) on 18 March 2009. Retrieved 28 April 2010. ^ "Faculties and Schools". Trinity College, Dublin. 17 February 2012. Retrieved 24 July 2012. ^ "Trinity Walton Club". Tcd.ie. ^ a b "Teens develop robot to teach children basics of coding". Irishtimes.com. ^ a b "Building a New Generation of Scientific Innovators". Universitytimes.ie. ^ Meehan, Sarah (28 November 2017). "Undergraduate name "Freshman" to change to gender-neutral "Fresh"". Trinity News. Retrieved 28 November 2017. ^ "Dual BA Program - Trinity College Dublin". gs.columbia.edu. ^ "Graduate Studies – Trinity College Dublin". Tcd.ie. 15 April 2010. Retrieved 28 April 2010. ^ "Topuniversities.com". Topuniversities.com. 12 November 2009. Archived from the original on 27 May 2008. Retrieved 28 April 2010. ^ Trinity College Academic Calendar. (12 weeks each), followed by three revision weeks and a four-week exam period. ^ "Trinity Regatta – Dublin University Boat Club". Archived from the original on 2 April 2015. ^ Undergraduate Admissions. "Admission Requirements". Tcd.ie. ^ Undergraduate Admissions (Email). "Admission Requirements" (PDF). Tcd.ie. ^ Undergraduate Admissions (Email). "Matriculation Examination Syllabus" (PDF). Tcd.ie. ^ Central Applications Office. "Restricted-Application Courses". cao.ie. ^ Undergraduate Admissions (Email) (26 February 2010). "A list of EU exams and conversion ratios". Tcd.ie. Retrieved 28 April 2010. ^ "TCD.ie". TCD.ie. Retrieved 28 April 2010. ^ "World University Rankings 2017 | Times Higher Education (THE)". Times Higher Education. Retrieved 9 March 2017. ^ "QS World University Rankings® 2017/18". Topuniversities.com. Retrieved 6 September 2016. ^ "Trinity College Dublin World University Rankings | THE". Times Higher Education. 30 June 2016. Retrieved 23 July 2016. ^ "Trinity College Dublin, The University of Dublin". Top Universities. Retrieved 23 July 2016. ^ "TCD and UCD drop lower in world university rankings". The Irish Times. 14 September 2015. Retrieved 26 March 2016. ^ "TCD launches €600m plan to break back into world elite". The Irish Independent. 22 October 2014. Retrieved 26 March 2016. ^ "ARWU World University Rankings® 2017". Retrieved 6 September 2017. ^ "QS-THE Rankings - Europe". universityrankings.ch. Retrieved 22 February 2018. ^ "Trinity College Dublin". Timeshighereducation.com. Retrieved 21 January 2018. ^ a b "Calendar 2016-Students' Unions, Societies and Clubs" (PDF). Trinity College Dublin. 5 October 2016. Retrieved 26 January 2017. ^ "Trinitysocieties.ie". Trinitysocieties.ie. 25 March 2010. Archived from the original on 29 October 2010. Retrieved 28 April 2010. ^ "Trinity News, Trinity Archive, 1 Nov. 2005, p. 20" (PDF). Retrieved 24 July 2012. ^ "Society | Central Societies Committee". trinitysocieties.ie. Retrieved 11 February 2017. ^ "DUCAC – Trinity Sport – Trinity College Dublin". Ducac.tcdlife.ie. 25 April 2016. Retrieved 23 July 2016. ^ E. Charles Nelson; Alan Probert (16 July 2011). "A Man who Can Speak of Plants: Dr Thomas Coulter (1793–1843) of Dundalk in ..." Retrieved 23 July 2016 – via Google Books. ^ "DUHC". Hockey.tcdlife.ie. Archived from the original on 4 June 2016. Retrieved 23 July 2016. ^ Brian Foley. "Dublin University Harriers and Athletic Club". Tcd.ie. Archived from the original on 21 January 2007. Retrieved 28 April 2010. ^ "Dublin University Fencing Club – Club News". Fencing.tcdlife.ie. Retrieved 23 July 2016. ^ "Trinity Publications". Trinitypublications.info. Retrieved 28 April 2010. ^ "Welcome to The Social and Political Review of Trinity College Dublin". Spr.tcdlife.ie. Retrieved 24 July 2012. ^ Dublin Life (Email) (26 August 2009). "TCD.ie". Tsmj.tcd.ie. Archived from the original on 8 January 2009. Retrieved 28 April 2010. ^ Paul Cullen (4 April 2010). "Old square hits Front Square". The Irish Times. By 11 pm, only a fraction of the 7,000 ticketholders have filtered through the security checks. ^ "last.fm events". last.fm. Retrieved 10 July 2009. ^ The Graduate Students' Union. "Information: The Graduate Students' Union". The Graduate Students' Union. Archived from the original on 1 July 2007. Retrieved 28 April 2010. ^ Kevin Rockett. "Michael Collins (1996)". Shot at Trinity. Trinity College Dublin. Archived from the original on 22 May 2015. Retrieved 20 May 2015. ^ David Ingoldsby. "The Great Train Robbery (1978)". Shot at Trinity. Trinity College Dublin. Archived from the original on 22 May 2015. Retrieved 20 May 2015. ^ Ruth Barton. "Circle of Friends (1995)". Shot at Trinity. Trinity College Dublin. Archived from the original on 22 May 2015. Retrieved 20 May 2015. ^ Conolly, Jez; Whelan, Caroline (2011). World Film Locations: Dublin. Bristol: Intellect Books. p. 38. ISBN 978-1-84150-550-3. ISSN 2045-9009. ^ "Salman Khan and Katrina Kaif to go back to college". Bollywood Hungama. 20 July 2011. Retrieved 24 July 2012. ^ Aidan Delaney. "Quackser Fortune Has a Cousin in the Bronx (1970)". Shot at Trinity. Trinity College Dublin. Archived from the original on 22 May 2015. Retrieved 20 May 2015. ^ 1974-, McCrea, Barry, (2005). The first verse : a novel (1st Carroll & Graf ed.). New York: Carroll & Graf. ISBN 0786715138. OCLC 60345313. ^ "Reviews: Thanks for the Memories". Archived from the original on 6 July 2011. Wikimedia Commons has media related to Trinity College Dublin.